Pioneering Bengali industrialist, Sir Rajendranath Mukherjee’s former home on 7 Camac Street has been restored and the results are jaw-dropping. 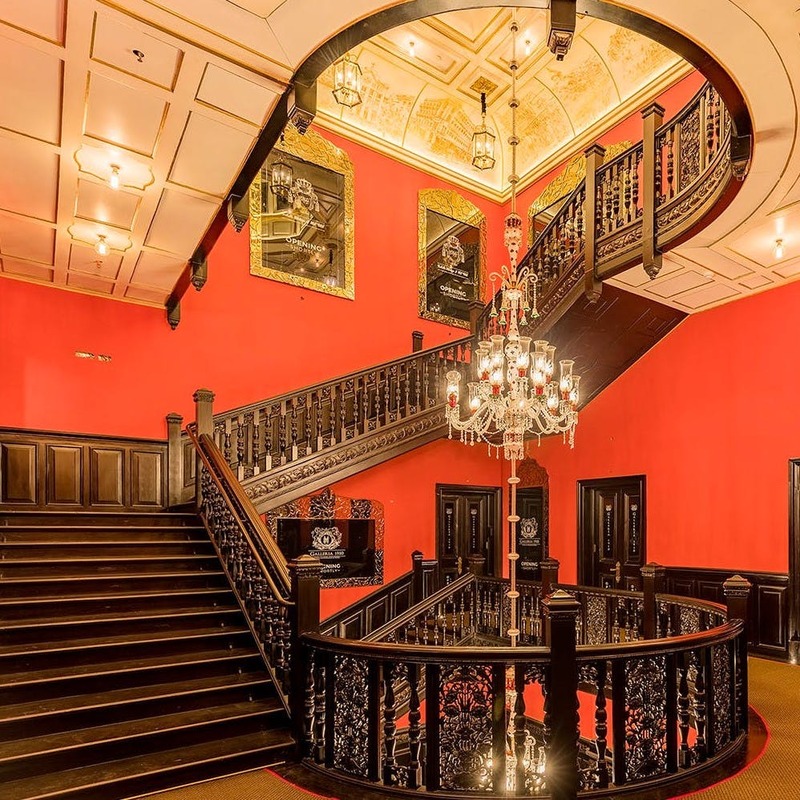 The highlight is the grand staircase, which is made completely of wood and has intricate craftsmanship on the bannisters. Original stained glass panes on the windows and doors have been kept. You must try out the cloakroom with wooden panels, and a ladies dressing area. But the star attraction is the massive chandelier, descending from the central glass dome above the stairwell. On the top floor, wall panels have pictures of monuments that Sir Rajen had built, including most of Kolkata’s prominent architectural landmarks. The red and gold colour scheme creates an effect unlike anything in Kolkata right now. Even the smallest details, such as the brass door handles, have been paid attention to. The building has been turned into a boutique heritage-themed mall that offers several unique experiences. There is more to do than merely gawk at the stunning interiors, especially if you’re a man. Imagine getting a shave from the same people who once shaved Charles Dickens or Winston Churchill! Truefitt & Hill, the world’s oldest barbershop, established in England in 1805 and currently Royal Warrant Holders to Prince Philip, Duke of Edinburgh, have opened up their first salon in India at this renovated heritage property. They will bring their traditional hot towel and wet shave experience to India. Prices range between INR 1,900 and INR 2,200. If you’re looking for jewellery, Kalyan Jewellers has set up shop on the ground floor, where they are promoting the work of local craftsmen. Soon to open up is also the Calcutta Heritage and Art Club which will be an art gallery. Fancy having a bite or a sip while admiring the architecture? Café Galleria is set to open soon as well.